This park and play area on the Delaware River offers class 1 to class 2+ rapids at water levels from 2,000 to 10,000 cfs on the Trenton gage. The quarter mile long rapid spans the river from bank to bank between Lambertville, NJ and New Hope, PA, below a wing dam that once diverted water for a paper mill on the PA side. First-timers should land on the dam and scout. Often used for paddling and safety training. The parking area is on the NJ side, and has ample parking, picnic tables and indoor restrooms with running water. The paddle to the dam is short, and the return is against a mild current. Most paddlers carry over the dam on the return trip, but if your are good enough and not too tired, the dam can be attained at lower levels. There is an outstanding surfing hole just below the tip of the PA wing (upper photo.) 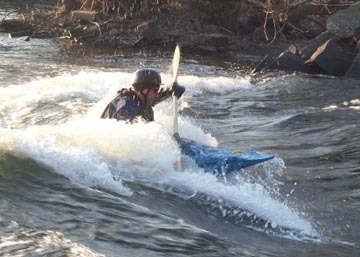 Photos courtesy American Whitewater. Directions. 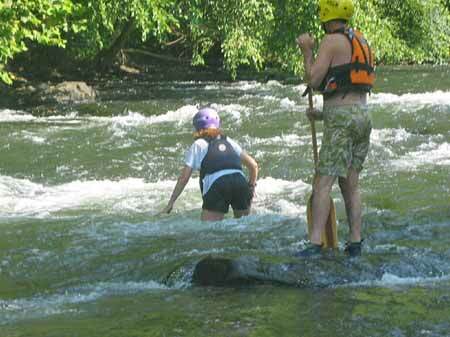 A popular play area on the Delaware just six miles downstream from the Lambertville Wing Dam. Right off I-95, the river is but a few feet from where you park your car! Class 2-3 depending on the water level and the hole or wave. Requires a bit more water than the wing dam. American Whitewater had good info and directions and lots of photos..